During the warm days of this past weekend, I became aware that I was being watched, closely, much of the time I was working in the yard. As the season grows darker with the coming of winter, it seems that the four-legged critters that we share the area with lose their fear am draw closer to the house. Not only have the deer been stalking me, but the yard is full of rabbits and squirrels. Makayla loves chasing them from the yard--but it is only a temporary measure. 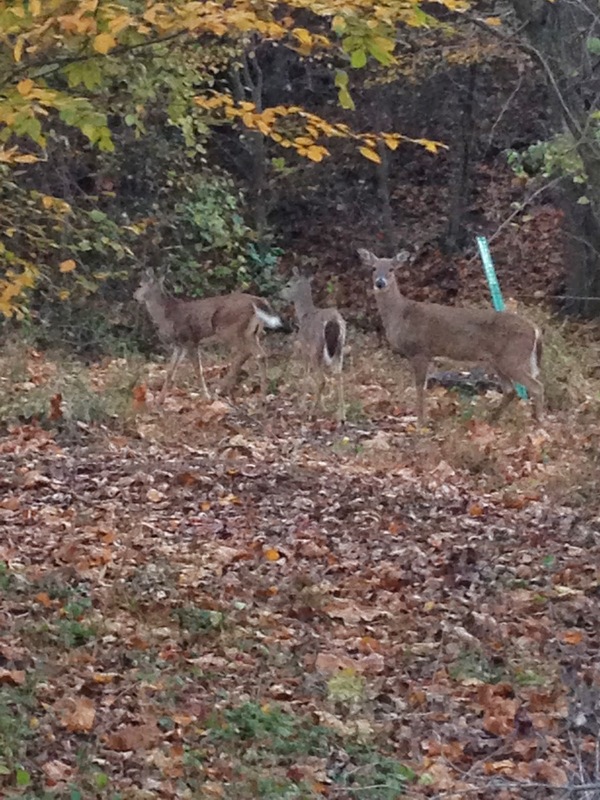 There were actually five deer near me that day. 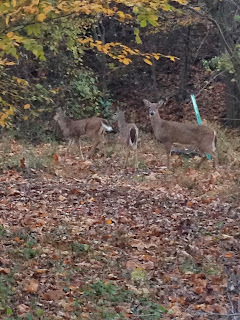 Two panicked and ran as I got close to the boundary separating my yard from the wild area, but these three remained hoping for a hand out, I think. I have watched to two smaller deer grow from fawns at the beginning of the year. I am amazed that they are still at their mother's side even as the winter draws near. I enjoy living on the boundary between civilization and the wild land. It is reassuring that there is so much wild space near us that it supports a thriving herd of deer--which, admittedly are a nuisance, but were more well behaved this year and did not eat the expensive flowers to the ground thinking they were a gourmet deer meal. I also was really amazed at how close they let me approach the group before the walked--not ran, away. They were never bothered by my presence until I got about 40 feet away. I was reminded of a golf outing a few weeks ago at twilight when the deer herds were running the golf course and I actually took one shot while looking a buck in the eyes. He was only about 20 feet away and totally unconcerned that I was swinging a club at a small white ball. I remember taking another shot across and above a small grouping of deer. They were very accepting of my presence. The frigid cold is approaching and with it winter-like weather. I'm sure I'll be seeing more of the deer and other critters in my yard seeking food.